Hindus are not looking for favors; rather they want a flattening of the discriminatory laws and a level playing field. Is that too much to ask? 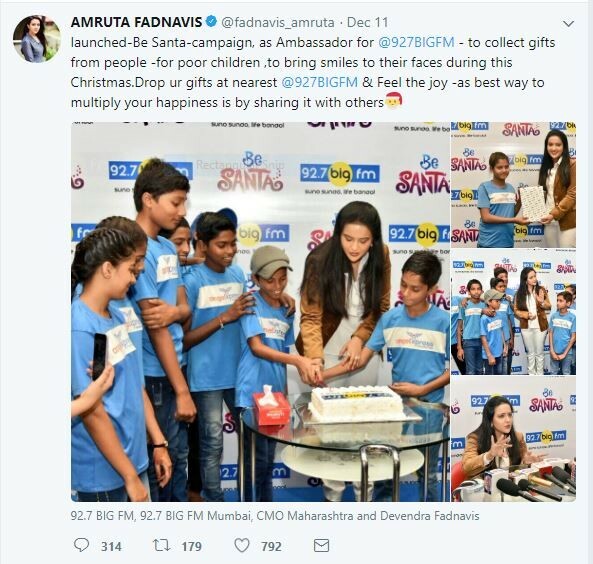 Much has been said about the very public spat on Social Media involving Amrutha Fadnavis, the spouse of the Maharashtra CM on the specific issue of her choosing to be the face of the “Be Santa” and “Giving at Christmas” campaign launched by Big FM. That this has snowballed into a much bigger controversy that threatens to show up the BJP in poor light is clear enough by the fact that party ideologue and one-time editor of the RSS weekly Shri Tarun Vijay (1) thought it fit to post a hastily written article in the TOI (2) defending the Maharashtra CM and his spouse. This article is not about the controversy, enough and more has been said about it by commentators of various hues and adding to it is like flogging the proverbial dead horse. Rather this is an attempt to examine the broad themes that Shri Tarun Vijay touches upon in his defense of the CM, his spouse, and the state government and benchmarking it against the evidence of the specific actions of the CM and the Maharashtra government some of which are indeed cause for concern particularly amongst Hindus. The examination is also an attempt to shine a light on how a small issue such as this turned out to the proverbial straw that broke the camel’s back. This angst and disappointment bubbling under the collective psyche of the Hindus is not just about Maharashtra but also about how they believe that the party they hoped would give them their due after several years of discrimination under the garb of secularism has done precious little to right the wrongs perpetuated over several decades and level the playing field. The article by Shri Tarun Vijay which seems hastily written, informs us that the Maharashtra CM and his spouse are both from the “ABVP and we share the same saffron school of thought that is inspired and nourished by the RSS” Further, in building his defense of the CM he alludes to the inherent syncretism and acceptance of the Hindu Dharma “She attended a Christmas charity and tweeted in a nice, decent way about it. That’s how a wife of the CEO of the state should have done and that’s how we all do whenever we go for a noble good cause that serves the society. But to make us feel so embarrassed and humiliated for our faith so much that I am forced to clarify my dedication and devotion to my Dharma is simply something we don’t connect with the Hindu spirit of living happily with different shades of beliefs and their fragrances in a garden called India” He concludes by pointing to the fact that even the Ramakrishna Mission celebrates Christmas, ending with “…Being a Ramakrishnaite myself, I celebrate that beautiful day wherever it is possible and I adore the compassion and love that I see in the eyes of Jesus” (2) Viewed in isolation it does seem a reasonable argument but then the reality is that few arguments can be viewed in isolation. Only when an objective assessment of past utterances and actions is made do the contradictions if any emerge. 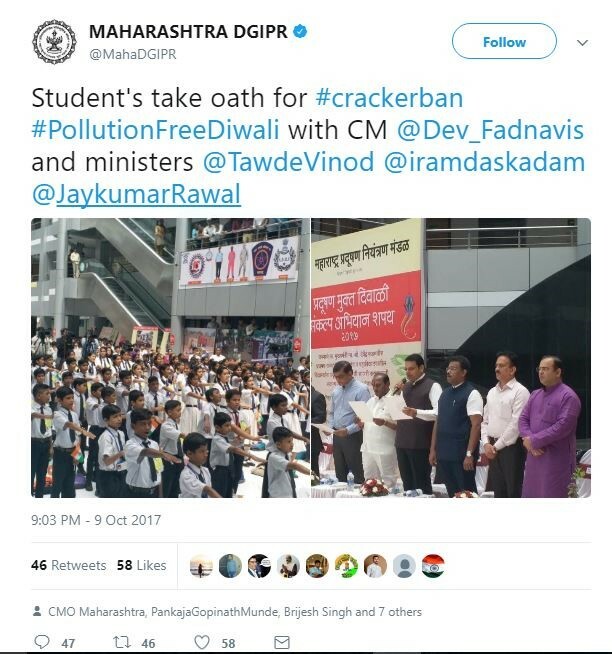 When Deepawali was round the corner and the Hindus across India were much agitated by the selective ban imposed on the sale of crackers by the Delhi High Court, CM Fadnavis seemed to be endorsing the ban through a series of pronouncements and action – He led a group of school children in taking a pledge that they would celebrate a pollution-free Diwali. He added “All Indian festivals have a bond with nature. People should take precautions that there is no damage caused to the environment so as to be able to live in a healthy and pollution-free environment.” (3) Now, it is nobody’s case that crackers do not cause pollution. In fact left to themselves, Hindus would have over time given it up of their own accord – anecdotal evidence indeed points to this fact. Again Diwali crackers are but for one day and surely there are better modes of intervention and bigger “tickets” that need to be addressed rather than indulge in tokenism. Also, the same argument that is being made out to defend the CM, now could be used here- “…the need to live happily with different shades of beliefs and their fragrances in a garden called India” Therefore the question that needs to be asked is, if it did not matter then, how does it matter now? 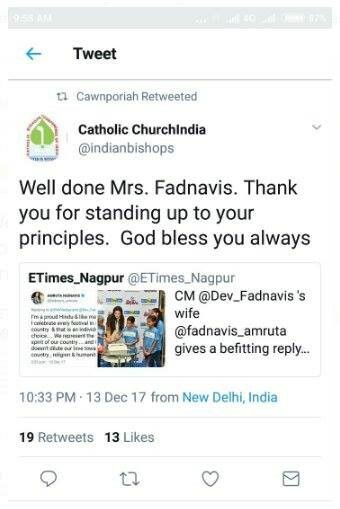 Shouldn’t the sentiments, beliefs, traditions, and culture of the Hindus matter and should they not be accorded the same respect and dignity that is being sought to be provided to a “minority” faith? How does one reconcile the tweet on the left (below) with the one on the right? The sheer dichotomy was best captured by one smart “tweep” who observed, tongue-in-cheek; “If we can have ‘Be Santa-campaign’; why not a ‘Be-Ram-campaign’ or a ‘Be-Krishna-campaign?” Indeed, why not? 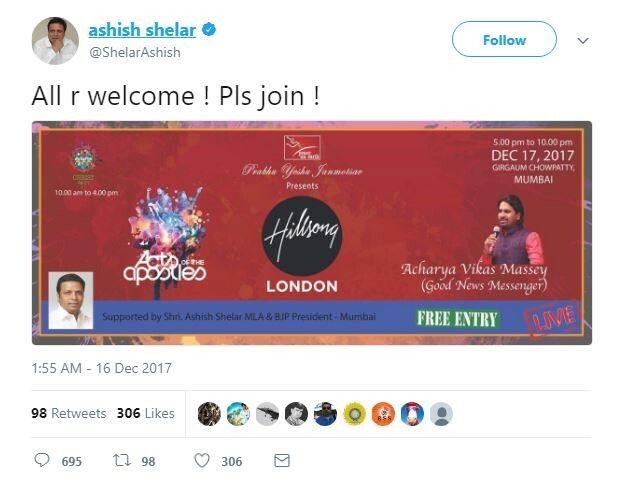 Interestingly, as per a report in the TOI (10) one other invitee to this forum was Dr. AG Ashok, a Bengaluru based businessman and secretary general of the Christian Renewal Movement (11) of India. As per the same report he is also on the board of several NGOs based out of India. It is precisely this kind of pandering that emboldens the Catholic Church to say this (see Figure 3) and the BJP state President and MLA no less to say this (see Figure 4). When a five-judge constitutional (14) bench upheld the Constitutional validity of the 93rd amendment to the Constitution of India and RTE Act, they essentially signed a death warrant for Hindu schools. The order while making it compulsory for unaided educational institutions to provide education to economically and socially weaker sections, through 25 % reservation, excluded the minority Institutions from the purview of this very same law. Additionally, not only are minority institutions outside the ambit of the RTE, the organization established to certify whether an Institution is a minority one or not, excludes by law any Hindu representation; i.e. no Hindu member can sit on the board of this body. This body the National Commission for Minority Educational Institutions (NCMEI) without a single Hindu member on its board is ironically mandated to decide the fate of a Hindu institution! (15) if a Hindu school were to apply for some relaxation of rules or aid for example. Data on school closures (16) due to the strict implementation of the RTE act shows that Maharashtra tops the list of schools that have been served closure notices and also closure threats. 7,000 schools in just one year (2015-16) were served closure notices. This seems to be a direct result of the BJP government’s strict implementation (17) of the sectarian and partisan RTE act that has hit Hindu-run schools in general and small Budget Private Schools (BPS) in particular really hard, leading to a slew of closures. These BPS schools (18) which are typically small rented premises or family homes charging tuition fees ranging from Rs.70-150 per month in rural areas, and Rs.200-600 in urban India cater to an important segment of the population – slum children and children from poor families in places where government schools are not located and/or private schools are unaffordable. As per last count there are a staggering 300,000 such schools across India with a cumulative enrolment of 60 million children. These schools mostly run by selfless Hindu “edupreneurs” are facing the brunt of the RTE act, because the RTE act not only mandates compulsory free education for 25% of the students but also requires these schools to comply with minimal infrastructure and teacher-pupil ratio norms (Section-19 (19) of the RTE act). 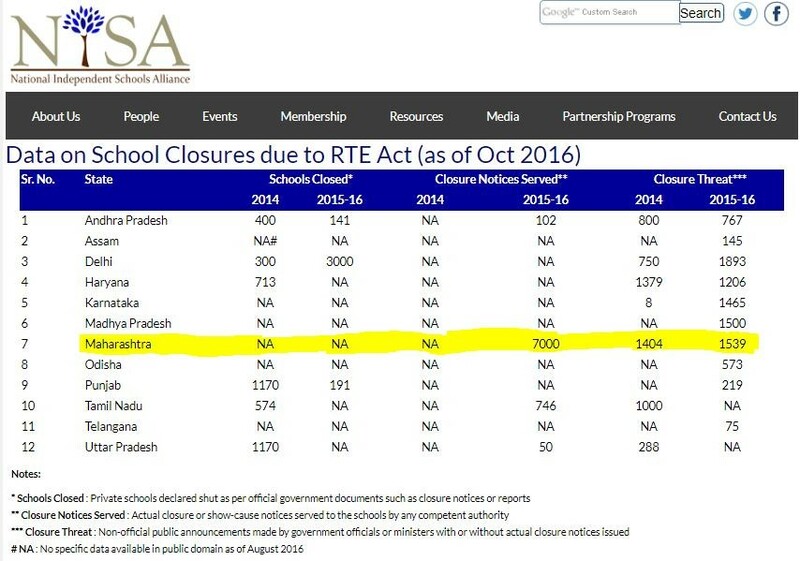 Closure notices are being sent to these schools which effectively means that the RTE act introduced to guarantee education to all is ironically denying education to those who need it the most. At a time when the government of India is talking about education for all, shouldn’t the State Government be helping these Hindu “edupreneurs” who are struggling against the odds and in a sense climbing the Himalayas without oxygen? Instead, the full force of the law is being used to crush them. The only reason is because the RTE law in its present form and shape privileges minority-run institutions while punishing majority-run institutions. In such a scenario is it not fair for well-meaning citizens to be reminding our elected representatives of their duties, priorities, and the concept of fair balance? Is it a crime to ask that the rules be flattened and the playing field be levelled? If the CM and/or his spouse can participate in a Be-Santa day with the purported purpose of “collecting gifts”, “Giving” to poor children, and bringing “Smiles” on the faces of the poor, the question of why that can’t be done for example to help children and “edupreneurs” of BPS schools, instead of forcing them to shut down becomes relevant. The sheer dichotomy and virtue signaling so clearly obvious in the Photo-ops sends out the signal even if unintentionally that Hindus don’t matter and it is this that well-meaning citizens are questioning. When the Shani Shingnapur protests by women of the Bhumata Brigade led by Trupti Desai (20) boiled over, the Maharashtra CM came out with this (21) “Indian culture and Hindu religion gives women the right to pray. A change in yesterday’s traditions is our culture. Discrimination in praying is not in our culture. The temple authorities should resolve the issue through a dialogue” The cultural and traditional dharmic rules that were behind the restriction of women’s entry into this particular temple (not all Shani temples) are neither the scope nor the purpose of this article and therefore will not be discussed here. However, what is moot here is this – Suppose we were to reverse the paradigm and assume for a moment that this were to be an Islamic place of worship, would the CM have made bold to hold forth as above? Isn’t that the true test of secularism – that the government will be absolutely fair in its dealings with all communities irrespective of their faith and/or religion? We actually have a tentative answer to this question. 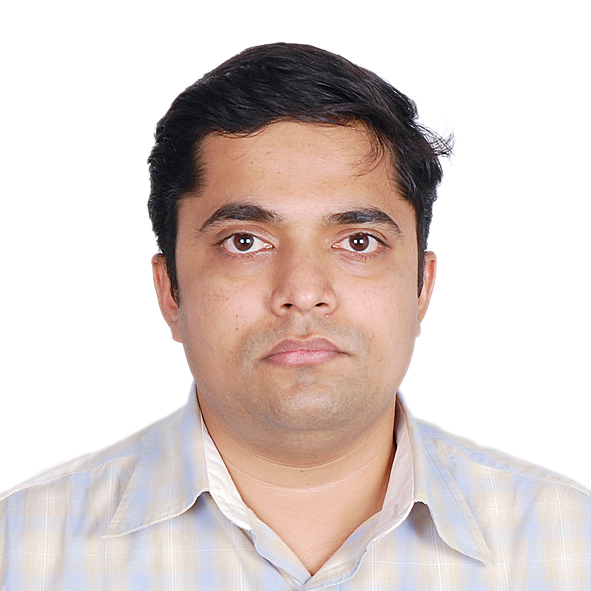 The Bombay High Court which is hearing the Haji Ali Dargah dispute has ruled that it would wait to see what the Supreme Court would say in the case of women entry into Sabarimala on the specious premise that “both cases are similar” (22) – Nothing can be further from the truth. In Sabarimala, unlike Haji Ali there is no blanket ban on the entry of women, rather it is an “age-restriction” based on the principle that the deity at this place is a Naishtika Brahmachari. There have been enough and more articles written on this clarifying this very principle including this (23) and therefore will not be discussed further here. The larger point however is that it has been seen time and again that issues pertaining to Hindus seem to be fair game both for the executive as well as the Judiciary and as a consequence we are witnessing a groundswell of angst, anger, as well as protests from the Hindus who have waited for justice and a level playing field for over 7 decades of free India. Today, those pointing fingers at the Hindus would do well to examine the reasons for the discontentment bubbling under the collective Hindu psyche. For the Hindu, it has reached a stage where it is now or never with the odds stacked against him/her and the establishment seemingly oblivious to his/her plight. This is the last theme that shall be explored in this article and pertains to a minor but significantly controversial Government Resolution (24) (GR) to the existing “statue policy” of the state government which was subsequently withdrawn (25) fearing social strife. Read together the resolution would have been a double whammy targeting the Hindus. 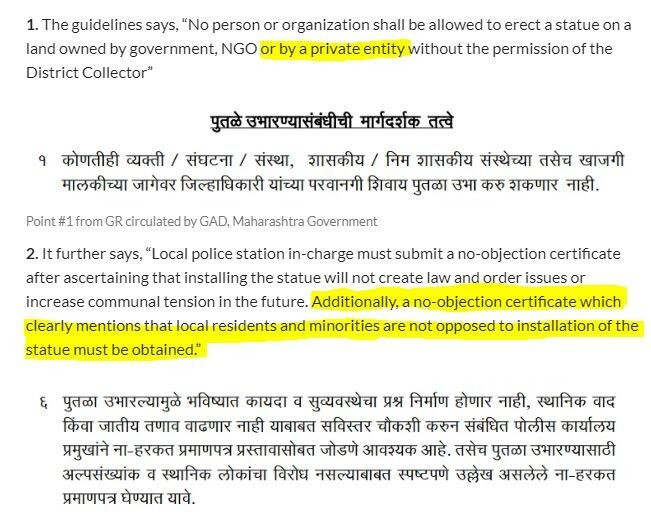 Not only would they have been prevented from erecting statues anywhere, even on their own private land without permission from the District Collector but additionally they would have had to obtain an NOC (26) from local residents and minorities. Clearly this clause would have been another in a series of laws that adversely affect and disempower the Hindus while empowering the minorities and one wonders what prompted even the thought of introducing such a lopsided notification in the first place, the subsequent hasty withdrawal notwithstanding. As Shri Tarun Vijay noted and as did several other supporters of the Maharashtra CM, the “Be-Santa” campaign was indeed made to look bigger than it actually was but the key point they forget or conveniently ignore is that this was the proverbial straw that finally broke the camel’s back. While this article was focused only on the Maharashtra government it has to be understood that this expression of outrage was not just frustration at the Maharashtra government but also at the incumbent dispensation at the center. Finally, this point needs to be stressed: Hindus are not looking for favors; rather they want a flattening of the discriminatory laws and a level playing field. Is that too much to ask? And finally for the real Hindu invested in the revival and strengthening of the Dharma the culture war will always be more important than the political battles but perhaps this is a small and increasingly marginalized section of society.